Oil painting on wood panel, 42 x 57″, by AVonnHartung. 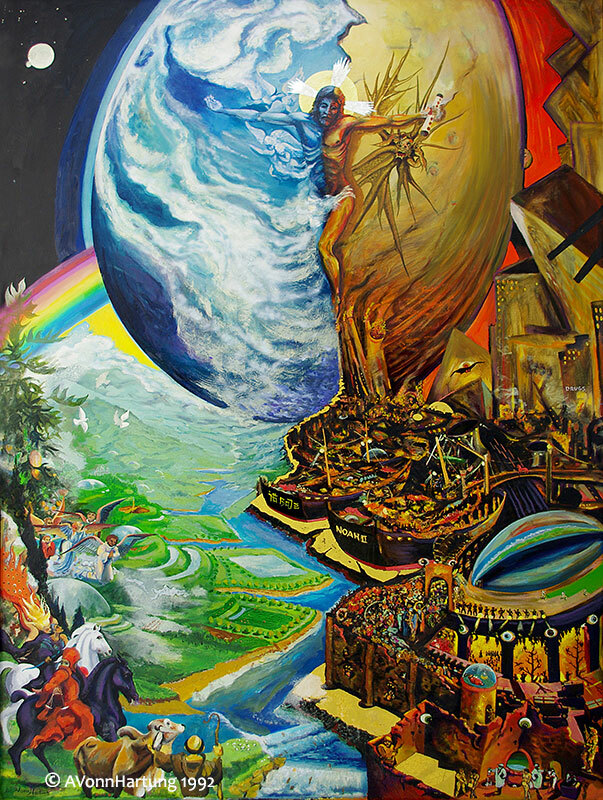 The painting is rhetorical in concept and presents us with two possibilities: one in harmony with God’s Creation, a future of justice, peace and sustainability. The other of plunder, chaos, endless war and an ultimate collapse of nature and life on our planet home as we know it. Earth is painted in the form of an egg, metaphorically symbolizing the fragility of Earth’s ecosystem as well as her natural abundance and fertility. The metaphor of the egg is also used to show a covenant broken and the resultant rupture of earth’s fragile ecology and humanity’s fall from grace caused by a flawed linear economic system based on the misuse of power and wealth, symbolized by the unholy use of GOLD. 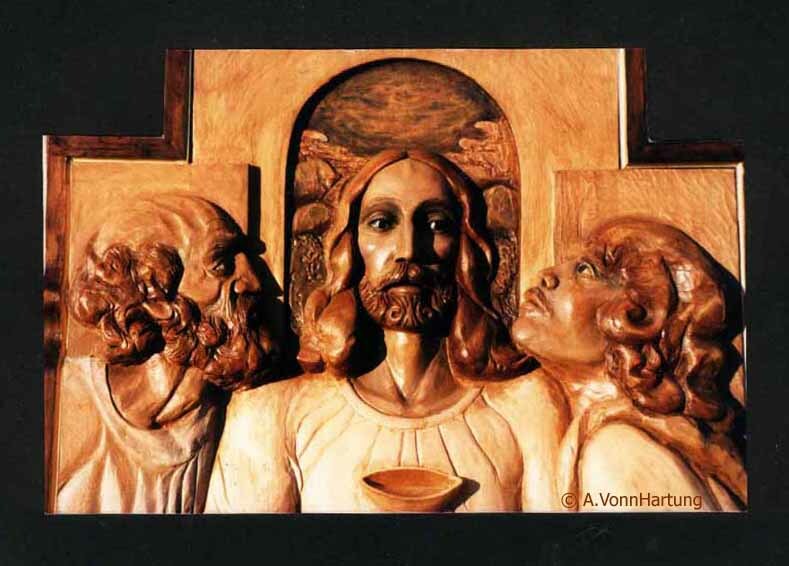 THIS PAINTING HAS BEEN ON DISPLAY IN MANY CHURCHES AND PUBLIC PLACES IN PUERTO RICO. NOW ON LOAN TO CENTRO BUEN PASTOR IN GUAYNABO, PUERTO RICO. Pope Paul VI reminded us that God put us in the center of his creation to take care of it. On the Fifth Environmental Day in 1977, he reminded us that “before man fell into sin the world was a paradise, beautiful, intact and of a harmonious nature …”, but nature began to change in a negative way when man rebelled against God. Christ reconciled humans with God the Father, with one another, beginning the reconciliation of man with nature. Caring for the environment is a moral issue. Pope John Paul II emphasized the priority of ethics over technology, and spirit over matter. If we destroy the earth, we destroy the divine creation, we destroy ourselves. Is that God’s plan? Is that our plan? Now with Pope Francis’ “Laudato Si”, the veil has been pulled aside and all the consequences of inaction and our responsibility is made clear. Let us, while there is still time, work in earnest to preserve God’s creation and our sacred, beautiful and life-giving home, Planet Earth. Published 8 November, 2018 at 603 × 800 in Murals and Retablos.